Pumpkin stew that’s made super hearty with vegetables and fava beans. 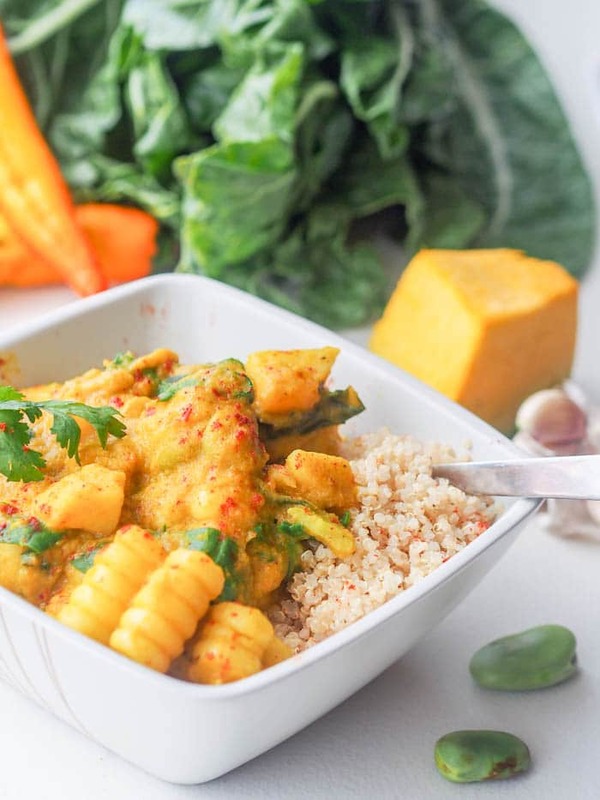 Inspired by a classic Peruvian dish and makes for a perfect vegan and gluten free dinner meal. Super high in protein, fiber, vitamin C, vitamin A and iron. A healthy comfort meal at its finest. 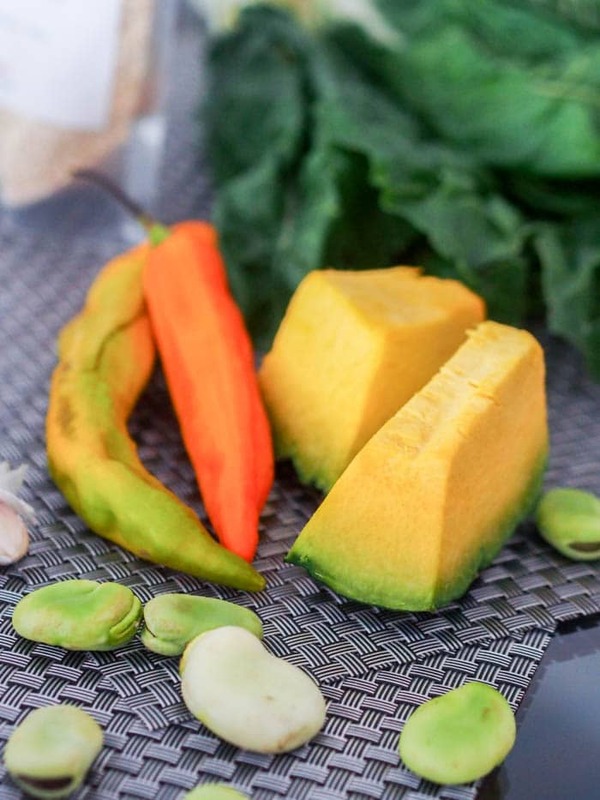 Pumpkin Stew with Fava Beans is inspired by a Peruvian recipe which was personally shared with me by a Peruvian university culinary professor. D and I have been traveling in Peru for the last month and while we have mostly been renting apartments I sometimes miss our old couchsurfing days (when you stay with a local for free). So to get the most of both worlds instead of staying with couchsurfers I scheduled a meet up with one. When I saw on Julio’s profile that he was as passionate as I am about food I knew our meet up would be great. And he did not disappoint. He quickly messaged back saying we could prepare some vegetarian Peruvian food together. Perfect. We met at the grocery store and the shopping began. $5 later we had all the ingredients to prepare a full pot of Locro de zapallo – a hearty Peruvain pumpkin stew popular in the Andean mountain range region. Yay! I could barely contain my excitement. The important first step in the recipe is to remove the seeds from the aji verde peppers to minimize the spicyness of the dish. Then the peppers, onions, garlic and olive oil all get pureed in the blender together. This sauce smells magical and immediately gets added to the pot. This I find to be the key to this magical hearty vegetable pumpkin stew. I need to start doing this with more recipes – blending a few key ingredients first as the base of the sauce. Then the diced pumpkin gets added, which is meant to be cooked until soft enough to mash into a puree. The potatoes and the fava beans in this recipe are cooked separately with the reserved cooking liquid being added to the stew for flavoring (in place of a broth) – also brilliant. Peru has over 2000 different types of potatoes and other tubers – yep 2000 – insane right? So in the US just go with regular potatoes (though Julio used a super colorful tuber as well as a unique Peruvian potato). Julio used cumin and black pepper for seasoning, but I decided to add a bit of curry powder into the mix as well. Once the pumpkin has been mashed and the liquid added the ears of corn, broken into pieces get added. 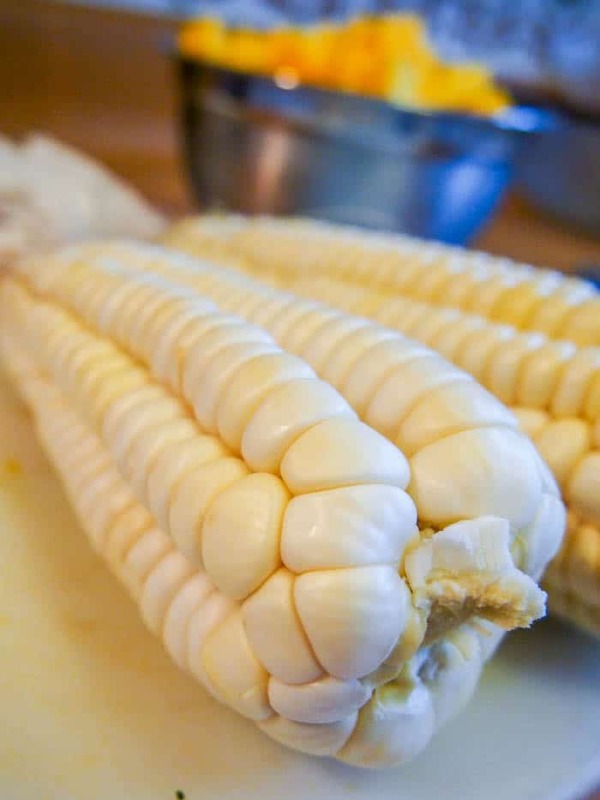 Peru also has tons of different types of corn with the ones we used light in color with huge corn kernels. Regular US corn will work here too. At the end of the cooking process the potatoes, fava beans and greens get added to the pot. Let those cook for a few minutes and your heart vegetable stew is ready. I absolutely loved this Peruvian pumpkin stew. It is super creamy and rich will being packed full of hearty vegetables and complemented with fluffy quinoa. Fava beans are a super underrated ingredient and now that I’ve been formally introduced to them through my Peruvian travels expect to seem them a lot more in my cooking. They’re packed full of protein, fiber and other vitamins and nutrients. 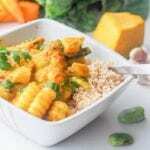 This pumpkin stew recipe is packed full of protein, fiber, vitamins A and C, and iron. You’re going to love it! If you liked this recipe you might also like my Alfalfa Salad with Kale, Quinoa and Avocado and my Mushroom Potato Rösti Sauce Recipe. Oh and you’ll definitely want some of this Strawberry-Ricotta Cheesecake for dessert! 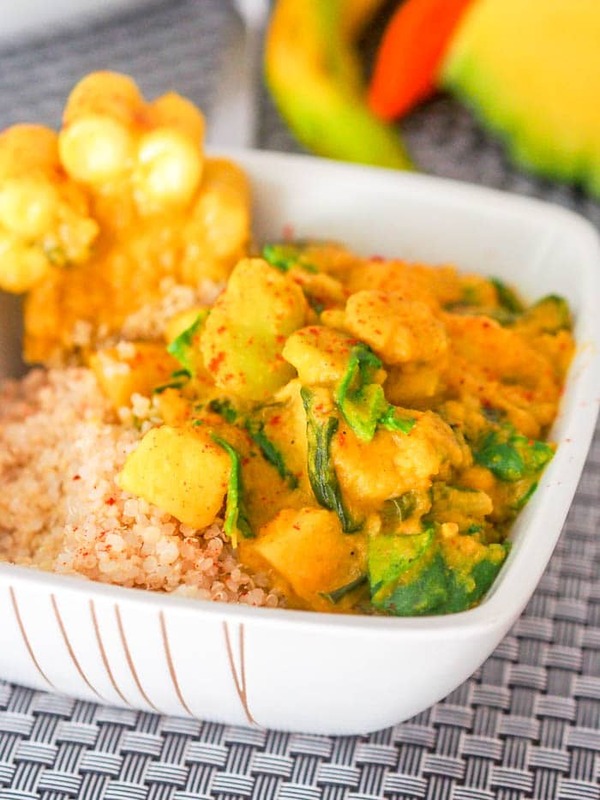 This hearty pumpkin stew with vegetables and fava beans is inspired by a classic Peruvian dish and makes for a perfect vegan and gluten free meal. Super high in protein, fiber, vitamin C, vitamin A and iron. A healthy comfort meal at its finest. In a blender combine aji peppers, garlic, onions and olive oil. Heat large pot over medium-high heat, and add pepper mixture. Cook for 5-6 minutes, stirring occasionally. Add potatoes to a separate pot and cover with water. Bring to a boil and cook until soft when pierced with a fork, but not falling apart. Drain potatoes, reserving the water. Add diced pumpkin. Cook 10-15 minutes, until pumpkin has softened. Using a spatula, mash the pumpkin into a puree. Add 2 cups of the reserved potato water. Add corn. Add cumin, curry and salt to taste. Bring to a boil, reduce heat and simmer. In a separate pot add fava beans and cover with water, bring to a boil and cook until soft. Drain, reserving the fava bean water. Add 1 cup fava bean water to the pot. Bring to a boil, reduce heat and simmer. Add potatoes, fava beans and collard greens to the pot. Cook for a few minutes. So happy to find a fellow couchsurfing food blogger – might be the first one! YES love fava beans as well. It was definitely a blast to learn how to make the vegetarian Peruvian stew – gotta love couchsurfing! Your travels sound fun and this looks amazing! LOVE the sweetness of the corn with the spices. What a great looking recipe! It’s so hard to find a delicious GL and DF recipe. This would be perfect for a Sunday afternoon. Love it! Thanks! You’ll find plenty of GF + DF recipes on here if you’re looking for more cooking ideas! Yum this looks so bright and beautiful! I haven’t cooked with whole pumpkin much before, but this recipe sounds delicious. Thanks so much for sharing – I love recipes like these. Thanks! The pumpkin is perfct here but you could also use any type of squash instead if you prefer that or can’t currently find pumpkin! What a heavenly sounding recipe! I need this in my life! Just clarifying~ the pumpkin goes into the chili mixture in the main pot. Then gets mashed with the chili to make the sauce/gravy. 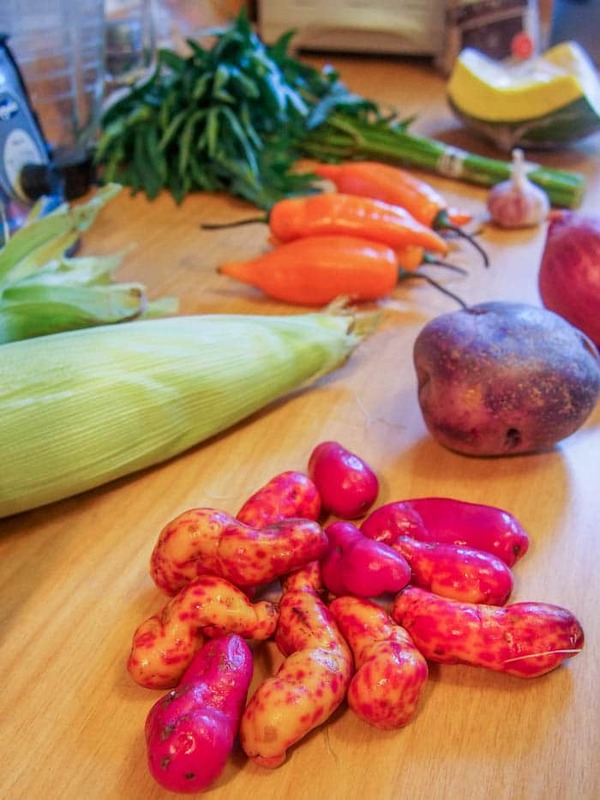 Interesting that they have such a variety of tubers and corn. Yes – exactly. First the blended mixture gets cooked for a few minutes and then the chopped pumpkin gets added and when soft, mashed into the blended mix. Yes I also find it fascinating that they have thousands of different types of potatoes. Wow this is gorgeous and my kind of meal. Those potatoes are so cool looking!!! I’ve never seen anything like them, so cool. Thanks! Yes Peru is insane with their 2000+ different types of potatoes. So crazy! I dont’ think there’s a Peruvian recipe that doesn’t have potatoes in it! 🙂 This looks great, what a great combination of veggies! Gorgeous! I love all the vibrant ingredients and flavors, this sounds so delicious! How have I still not used pumpkin in a savourry dish?!?! This looks divine!! I love pumpkin so much in sweet stuff, I just know I’d love it in this too! I love this recipe and have cooked in several times now. I use roasted pumpkin as I find it adds a richer flavour and I often roast extra pumpkin for soups etc when I cook it – I am Australian we eat savoury pumpkin rather than sweet pumpkin dishes. I make this in big batches and on the day I make it usually serve it with cauliflower and broccoli ‘rice’ to increase the veggie count. I also serve it as a sauce over fish or chicken with brown rice, it has become a firm favourite in our house in all it’s forms.